From the beginning we’ve always had high hopes of getting a not-for-profit entity off the ground to ensure the continued development of the OpenAustralia website as well as provide a foundation from which we can launch cool, new, useful things for everybody. 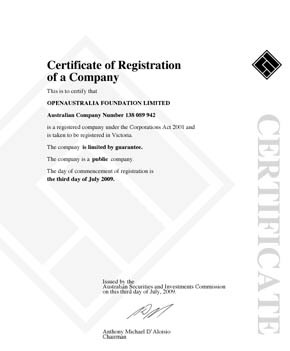 Because today we heard from our lawyer (the ever helpful Stephanie Barnes at Deacons) that OpenAustralia Foundation Limited is officially incorporated as a company limited by guarantee. The next step: applying to the tax office to get endorsement as an income exempt charity and also importantly apply for deductible gift recipient status. Yes, we’ve had to do a lot of paperwork and yes we will be sharing it with you. This includes the company constitution which clearly lays out the aims and responsibilities of the company. This entry was posted in Announcement and tagged openaustralia foundation, registration, tax. Bookmark the permalink. Post a comment or leave a trackback: Trackback URL. Happy birthday (birth? ), OpenAustralia Ltd! Congratulations Matthew & Katska (and everyone who helps out with OpenAustralia)! Congrats. A lot of hard work to get to this point.